A frosted glass in your hand. The earthy smell of brewer’s yeast. The smooth and bitter taste of a complex beer. Look around, and listen. Is that jazz? An abstract painting? A beer and arts tour is a thrill for all five senses. What better place than Vermont to undertake the experience? You’ll find arts of every kind and an abundance of beer styles to suit every palate. With your pleasure in mind, the Council consulted the Vermont Brewer’s Association’s website to plan a few perfect pairings. So, it’s time to check the Vermont Arts Calendar, open your Brewery Passport Challenge app, and give a call to your favorite designated driver. This is a tour you don’t want to miss. Two towns with lots to offer – on separate sides of the state – are Bennington and Brattleboro. Bennington’s brewery offerings are small but mighty and include Madison, Northshire, and Harvest. The last boasts live music and a gallery, but has competition in the region. The town’s galleries include the Laumeister Art Center and Fiddlehead at Four Corners. Nearby Manchester’s Southern Vermont Arts Center is home to the largest sculpture park in Vermont. Check out the North Bennington Outdoor Sculpture Show for more outdoor art. Take advantage of a long summer day to discover the artworks, trails, and historic schoolhouse of the Bennington Museum. Traverse the Green Mountains on the historic Molly Stark Byway before the sun sinks too low in the sky and you’ll be drinking craft brews in Brattleboro as the evening fades. You can even stop along the way: Beer Naked Brewery sits atop Hogback Mountain and promises tasty brews with unparalleled views. Once in Brattleboro, don’t miss the sour beers at Hermit Thrush. When the need for nourishment kicks in, consider McNeill’s or Whetstone Station for fresh food with small-batch brews. The arts take many forms in Brattleboro, so don’t over-imbibe! Mitchell • Giddings offers stunning fine art; Gallery in the Woods features the surreal and sacred; the Brattleboro Museum and Art Center has something for everyone. Head to the Vermont Jazz Center for toe-tappin’ tunes or the Brattleboro Music Center for an orchestral or choral performance. Head north on I-91 and stop to stretch your legs at Simon Pearce in Quechee. See a glassblowing demonstration or shop handmade glassware and ceramics designed to last generations. If you’re in the mood to meander, visit the Path of Life Sculpture Garden. You can quench your growing thirst at Harpoon Brewery in Windsor. Continue north to the thriving arts community of White River Junction (WRJ). Home to theater company Northern Stage, the Center for Cartoon Studies, and the Writers Center, this village is bursting at the seams with creativity. The Tip Top Media and Arts Building houses artist studios like Two Rivers Printmaking, Tip Top Pottery, and Patrick Dunfey’s 225 Gallery. There are dance studios, craft shops, and a vintage clothing store that features upcycled items by Vermont artists and designers. White River Junction’s only brewery – River Roost – is worth a visit. Take a detour west on Route 4 to reach the Long Trail Brewing Company’s German-inspired pub. You have a multitude of arts options on your way – try ArtisTree Community Arts Center, Pentangle Arts, or Vermont’s oldest artist-owned gallery, Fox Gallery. Just a little past the brewery lies the city of Rutland, where you’ll find the Paramount Theatre, the 77 Gallery, the Alley Gallery, and the Chaffee Art Center. Heading east on Route 4 takes you into Vermont’s heartland. Off Route 12A you’ll find Bent Hill Brewing. The agricultural brewery grows hops and fruit which add up to some wild flavors, including Cherry Graham Cracker Ale, Chili Coconut Cinnamon Stout, and Valencia Lemon Ginger IPA. You may feel like you’re in the middle of (beautiful) nowhere, but lucky for your art-seeking soul, the town of Randolph is close by. Chandler Center for the Arts houses a gallery and performing arts space and hosts workshops and festivals for all. 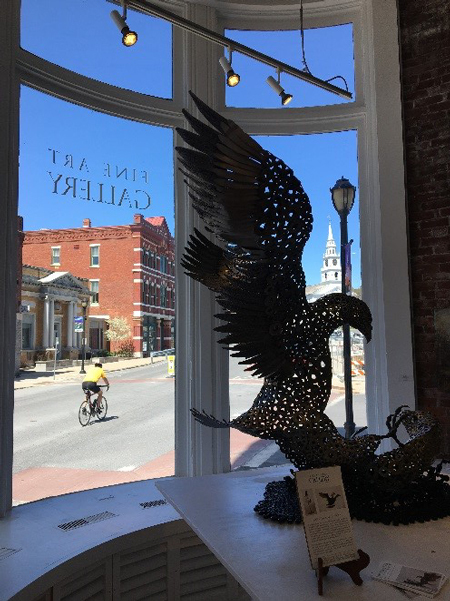 Half an hour up the highway brings you to the capitol region, where arts abound. Walk through the Vermont Arts Council’s sculpture garden, poke your head into Montpelier galleries The Front, the Supreme Court Gallery , the Governor’s Gallery , the Spotlight Gallery, the T.W. Wood Gallery, and the Artisan’s Hand. 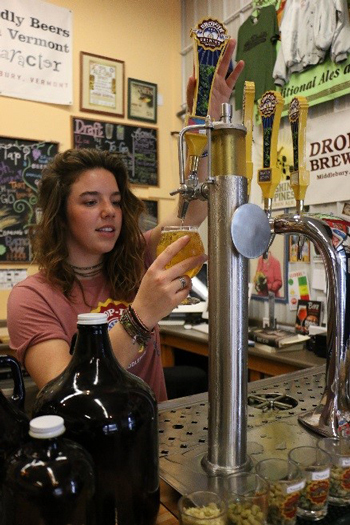 On your way to neighboring Barre, stop into the newly opened Dog River Brewery on the Barre-Montpelier Road. Once there, don’t miss three floors of exhibits at Studio Place Arts. The town calls itself the Granite Capital of the World and has a sculpture tour, historic cemetery, and Granite Museum to back up the name. Alternatively, venture a little off the beaten path to Good Measure Brewing, in Northfield. Everyone knows Burlington is filled to the brim with good art and good beer. But what about Stowe? Middlebury? The Northeast Kingdom? There are no bad choices. If you go the Stowe route, you’ll hit Waterbury on the way. Plan your visit to coincide with the Waterbury Arts Festival in July. The small downtown merits a walk around at any time of the year, and Axel’s Frame Shop & Gallery always has local art on the walls. Waterbury’s Prohibition Pig has made the town rather famous in the craft brew community. Best bets for beer in Stowe include Von Trapp Brewing’s Bierhall, Idletyme Brewing’s beer garden, and the Alchemist’s tasting room. Top art picks are Helen Day Art Center and outdoor sculpture walking tour, Stowe Craft Gallery, Edgewater Gallery, and West Branch Gallery and Sculpture Park. The building that contains the latter offers libations as well. Stowe Cider – okay, it’s not beer – is a delicious option for gluten-avoiders or anyone who enjoys life on the semi dry side. Bonus stop: just 15 minutes from Stowe is Morrisville, a low-profile place with a fantastic art scene and two great breweries. River Arts offers two galleries of changing exhibitions. Visitors walking through the downtown will see sculptural trees by Gordon Auchincloss. Rock Art Brewery and Lost Nation Brewing capture the spirit of Vermont; check them out and you’ll see! 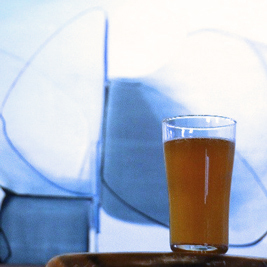 Ten Bends Beer – a mere five minutes away, in Hyde Park – often features work by local artists in the taproom. No arts tour of the Northeast Kingdom would be complete without a trip to Highland Center for the Arts, a new venue modeled after London’s Globe Theatre. It’s in Greensboro, as is Circus Smirkus and a little thing called the Best Brewery in the World (!). Also a local favorite, Hill Farmstead has earned the prestigious title from website RateBeer for four years running. Another of the Kingdom’s crown jewels is St. Johnsbury, where Dog Mountain rings out with live music all summer long. The St. Johnsbury Athenaeum houses more than one hundred sculptures and paintings – mostly originals – and Catamount Arts sponsors films, performances, and music throughout the year. You may guess that the town has a brewery as well (aptly named “Saint J”). If you’re willing to take it slow, you’ll find other arts and beer offerings scattered throughout the region, with breathtaking scenery in between. The Bread and Puppet Theater and Museum in Glover is powerful and fascinating. Red Barn Brewing in Danville will make you feel at home no matter where you come from. Don’t miss the Museum of Everyday Life on the way to the MAC Center for the Arts and Kingdom Brewing wayyy up in Newport, 15 minutes from the Canadian Border. If you’d rather venture toward Middlebury, you’ll want to make a few stops along the way. You could spend a whole day bopping in and out of galleries in the Mad River Valley. 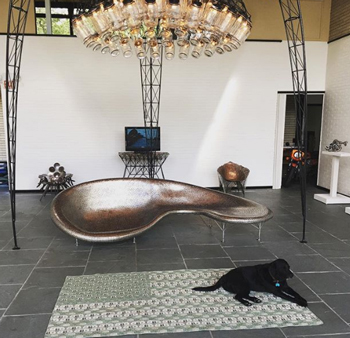 Whether you prefer visual art, blown glass, or artisan-made pieces, the center of Waitsfield provides. The area also offers Blacknewt Sculpture Studio, which displays large metal creations along the road; the Madsonian Museum of Industrial Design, which represents an artist’s “lifetime of appreciation for and devotion to good design;” and the Bundy Modern, where a black lab named Nina will greet you at the door of the Bauhaus style gallery. When you’re ready for a cold one, stop in to Localfolk Smoke House, which serves as tasting room for the tiny basement brewery Cousins Brewing. Keep on through the Appalachian Gap, past Bristol Falls, and you’ll reach the Bobcat Café, which has an extensive list of beers brewed in-house. Another 20 minutes and you’ll make it to Middlebury, a mecca for arts and culture. 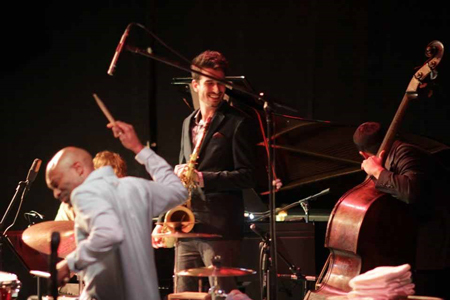 Middlebury College and its Mahaney Center for the Arts offers staged performances, visual art, film showings, and more. Galleries in town include Edgewater Gallery, the PhotoPlace Gallery, the Henry Sheldon Museum, and the Vermont Folklife Center. The Town Hall Theater is an historic gem where locals gather for plays and films. Plan your visit for late August, when the Middlebury New Filmmakers Festival comes to town. 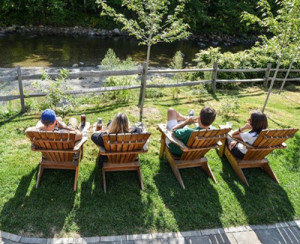 Middlebury is also headquarters to two major players in the state’s beer scene: Otter Creek Brewing, one of Vermont’s oldest and best known; and Drop-In Brewing, which is also the site of a nationally renowned school for craft brewing science. Drive a little further and you’ll find yourself in Vergennes, a tiny city with a big art scene. Make time for the Vergennes Opera House, Northern Daughters Gallery, and the Creative Space Gallery. Hired Hand Brewing will handle your beer needs. That’s a wrap on the ultimate Vermont beer and arts tour, even though we couldn’t possibly mention all the worthy spots to stop. The Vermont Brewer’s Association touts “beers worth finding,” and since Vermont arts are everywhere, you’ll always find something nearby. Visit the Vermont Brewer’s Associate website for information on their Brewery Challenge Passport Program.